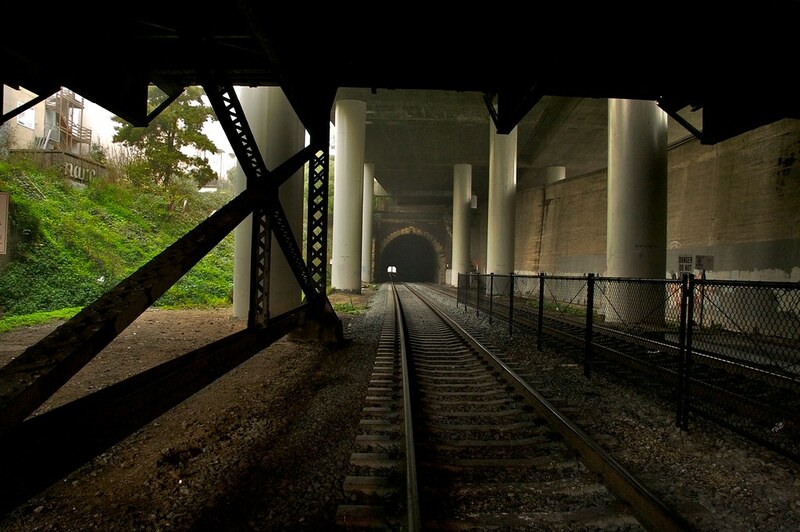 For years, the question of "grade separations"  separating a roadway from the rail line it crosses by using a bridge or tunnel  has periodically risen in Menlo Park, spurring a study on the feasibility of such a project. Then, after the study is completed, the topic retreats from the Menlo Park collective agenda, only to resurface several years later. In 1965, Southern Pacific, which operated the railroad before Caltrain, conducted grade-separation studies on the Peninsula, and then followed up with more grade-separation studies in the 1970s. In 1990 Menlo Park conducted a grade-separation study. In 2003 Menlo Park conducted another such study. In 2009, the San Mateo County Transportation Authority looked at grade-separation alternatives in Menlo Park. This decade's review is overdue, said Nikki Nagaya, the city's transportation manager. In 2015, the San Mateo County Transportation Authority agreed to reimburse the city up to $750,000 to conduct another grade-separation study. The city hired the consultant group AECOM for $631,300, and the firm held a community meeting May 2 at the Arrillaga Family Recreation Center to gather public comment. Menlo Park's most highly trafficked Caltrain crossing at Ravenswood Avenue is the city's priority, but the three other crossings  at Oak Grove, Glenwood and Encinal avenues  have also been factored into the current study. This time, though, Ms. Nagaya said, there could be more momentum. A fatality at the Ravenswood Avenue crossing in February 2015 spurred community support for action to make the crossing safer. Median barriers were installed on Ravenswood Avenue between Alma Street and Noel Drive in an attempt to reduce complications near the crossing that can lead to cars being stopped on the tracks. With El Camino Real, the Caltrain tracks, and crosswalks at Alma Street all within a short distance, it's a complicated stretch of road for drivers to navigate. As traffic and train trips increase, the hazards could too. Caltrain runs 92 trains per weekday through Menlo Park, and that number is expected to increase: up to 114 trains per day are planned when Caltrain is electrified, and up to 128 trains per day when high-speed rail begins service, said the consultants from AECOM. A total of 24,000 vehicles cross the tracks at Ravenswood Avenue each weekday, according to the consultants, and that number, too, could increase. The other crossings have lower, but not insignificant, traffic: about 10,000 a day at Oak Grove Avenue, 6,000 at Glenwood Avenue and 5,000 at Encinal Avenue, AECOM says. The 2003 study winnowed six options for the Ravenswood Avenue grade separation to two: either tunnel the roadway under the tracks or partially raise the tracks and partially lower the roadway. Consultants said that one logistical challenge is Caltrain's non-negotiable requirement that the elevation change of the tracks be at no more than a 1 percent grade. That could complicate things if the city were to go for the hybrid approach of partially lowering the road and partially raising the tracks. At a 1 percent grade, explained Angela Obeso, Menlo Park associate engineer, it would likely take a long distance to raise the rail line enough to get a sufficient gap between the tracks and the road beneath. If the tracks can't be lowered to ground level in the distance between Ravenswood and Oak Grove avenues, it might make sense to keep Caltrain elevated and build additional grade separations at the city's other rail crossings. That would make the project much more expensive and time-consuming. Examples of hybrid underpasses where tracks are elevated and the road lowered are the crossings at Holly Street in San Carlos, 42nd Avenue in San Mateo and Ralston Avenue in Belmont. One potential problem with the option to tunnel Ravenswood beneath the current track grade is that it could block access to Alma Street from Ravenswood, since there would be only a short distance to bring the road back to the level of the current street. Some residents expressed concern at the community meeting that doing so could shift traffic to nearby streets or make the Burgess Park and Civic Center area difficult to access. An example of tunneled grade separation is the Jefferson Avenue crossing in Redwood City, said the AECOM consultants. With either option, the project would be a long-term commitment. After the current study is completed on the Ravenswood Avenue grade separation  which is expected to take a year  the project would have to undergo a detailed design process and an environmental impact review, which would likely take several more years, Ms. Obeso said. The construction would most likely require building a "shoofly," a temporary track to reroute the train. A very rough estimate of a construction timeline is 18 to 24 months, but, consultants said, that could vary based on many factors, including which plan the city chooses. Future community meetings on the Ravenswood Avenue grade separation are tentatively scheduled for sometime in the August-September and November-December periods. Future City Council study sessions are planned for October and January. Go to the city's web page on the project for more information. The reason why grade separation has been studied over and over again, but nothing done is because it costs so much, on the order of $100M per intersection, plus or minus. Studying all the possible alternatives and getting community input is great and all. But at the end of the day, it's meaningless unless there is money to pay for grade separation. SMCTA's remaining Measure A grade separation funds will almost all be eaten up by San Mateo's 25th Ave grade separation project. There will be no money left. Even if there was, Burlingame's Broadway grade separation would get first dibs as they are further ahead in their planning and have a more dangerous grade crossing. Menlo Park would then be next. I doubt the state nor federal government will be putting up the majority of the funding. They may contribute a little bit. It's not clear where most of the money to pay for grade separation will come from. Screwed up by not grabbing the money when they could. NIMBYs win again! Troglodytes unite! Money was available to complete grade separations 10 years ago. We could have elevated the tracks all the way through town and have all the intersections grade-separated. NIMBYs raised a ruckus about the shadow that elevated tracks would cast on their back yards and the city caved to them, shutting down all grade separation projects for a decade until now it is too expensive to complete. Maybe if the city starts saving up, we could have enough money available in another 10 years to finally get this done. If all the money spent on the studies over the last 40 years, were spent on a grade separation it would have been paid for by now. Ditto on Sheldon's comment. This conversation has been on going for years. and will continue to be studied until the cows come home. Good work Menlo Park. See what happens when you study the hell at of everything. Meanwhile, in many neighboring communities such as Belmont, Sn Carlos, San Bruno, etc.., they enjoy their MUCH QUIETER time, with better traffic flow. Well done, MP, the city that knows.... ummm. Enjoy the clanging gates, loud train horns, and backed up traffic in the center of town. I'll shop and eat elsewhere unless I have to. MP is the city that knows how to stymie any kind of progress. We are a "village" after all, right? A "village" of 35,000 citizens. That would typically be defined as a "city." The "no birds" know how to stop any progress in MP. One of those ways is to study something to death. "Great" job "no birds." Funny thing, many of those folks are probably the very same people demanding that "something be done" about the Ravenswood grade crossing. Hypocrites much? Before posters start vilifying the supposed nimbus, take a moment to consider the three peninsula hybrid intersections (Holly St 42nd Ave and Ralston Ave). None of these abut residences. Now think about MP. From Oak Grove to Holbrook Palmer Park, and then into Atherton, the tracks run right along peopleâ€™s backyards. Does it really make sense to have trains running 110 mph that close to where people live? What if there is a derailment? People have died, even within the past few months, during derailments that occurred while trains were traveling at slower speeds and at ground level. The alternative of lowering the streets at these intersections would cause some homes to lose their driveway access, which means these homes would likely succumb to eminent domain. These are complicated issues that require careful evaluation and community engagement to sort out. Insults arenâ€™t helpful. The only way to minimize the impact of derailment on adjacent properties would be to put the trains in a trench or a tunnel. And the risk to lives on adjacent properties is significantly greater in commercial and office areas rather than residential areas because of the higher density of people in commercial and office areas. "And the risk to lives on adjacent properties is significantly greater in commercial and office areas rather than residential areas because of the higher density of people in commercial and office areas." -- A red herring in this case. Of the three peninsula intersections with hybrid grade separations, only one (Ralston) has adjacent commercial development (auto repair shops, and similar light industrial) and that is only on one side. All other intersections have parking lots and roads on either side of the tracks. There is no local precedent for running hybrid grade separations through residential neighborhoods. The best way to guarantee zero derailments and to implement such a program for no money is to end all train service. That solves the safety issue and solves the money issue. Of course, that exacerbates the traffic issue big time. Essentially, this is a public policy choice of choosing the right balance among three intertwined issues: train service, safety, and cost. You can choose to optimize two of the three, but you can never have all three. As soon as you improve service and safety, cost balloons. If you try to maximize service and minimize cost, safety is sacrificed. If you maximize safety and minimize cost, service is then sacrificed. There is no ideal solution, rather finding the right mix of choices that the public is least unhappy about. "And the risk to lives on adjacent properties is significantly greater in commercial and office areas rather than residential areas because of the higher density of people in commercial and office areas." -- A red herring in this case"
Wrong. The Ravenswood intersection has commercial on two sides, a LIBRARY and a train station - with a combined occupancy far greater than if these parcels were residential. 'Wrong. The Ravenswood intersection has commercial on two sides, a LIBRARY and a train station - with a combined occupancy far greater than if these parcels were residential." Sorry, Peter, you are wrong. The Library is across Alma and a sizable park-like area, and the train station would need to be moved if the tracks were raised 20 feet. Again there is no precedent on the peninsula for running trains on raised rails adjacent to homes. Raising the tracks for trains going 110 mph behind homes on small lots is concerning. To restate my original point, solutions here are not easy. "Rather than physically separate the rail corridor from the crossing streets, the rail authority plans to pursue less dramatic and less expensive safety measures: new perimeter fencing and four-quadrant gates at all grade crossings." "Caltrain's plan to electrify its train system and increase the number of trains could further exacerbate the problem. The combination of six Caltrain trains and four high-speed trains running in each direction during the peak hour means that a train will be passing through every three minutes, creating traffic delays as the gates close and reopen to cars." Aside from issues of whether SF-SJ will ever be built, this is the stupidest idea yet. You can kiss HSR money for grade separation goodbye.
" The Library is across Alma and a sizable park-like area, and the train station would need to be moved if the tracks were raised 20 feet." And you honestly think that a derailed train "running 110 mph" would not traverse that distance in seconds?? It is my understanding that Caltrain doesn't run their trains any faster than 79 mph, even on the grade separated portions. From this link: Web Link "The Baby Bullets have the same top speed of 79 mph"
At the HSR meeting they claim that once the bypass tracts are complete all trains (HSR and caltrain) will be running up to 110 mph. The HSR Authority claims all kinds of things. Pretty much all of their claims are BS. Sounds like there is interest in exploring the more expensive trenched track option. it would be the safest, would enable at grade crossings for autos and pedestrians with no impediments, would minimize land grabs (other than during construction for shoofly tracks) and would be the most visually appealing since the trains would be out of sight. No matter what the solution, it is unconscionable to still have grade crossings in the 21st century. Menlo Park should stop dragging its feet on this issue. If the city wants a design that costs more, then we should agree to tax ourselves in order to achieve that goal. Interest rates are at historic lows. It will never be cheaper to borrow enough to build something good. The solution will ultimately be to do something similar to San Carlos. The question is how much money will be frittered away on overpriced and irrelevant studies before then. Let's take the big view and come up with a win-win solution. "Today Switzerland is opening a new St. Gotthard Tunnel. It will be the worldâ€™s longest RR tunnel (58 km / 36 miles) replacing the legendary old tunnel (16 km) built 140 years ago. The new tunnel will be the central component in an effort to significantly upgrade fast RR infrastructure between Northern Europe and Italy for cargo and passengers. Another 16 km tunnel between Bellinzona and Lugano will be completed in 5 years, and new container terminals near Basle and Milano / Novarra will replace inadequate infrastructure for cargo transport thru the Alps, which should double in the next 15 â€“ 20 years. The new tunnel is an outstanding engineering achievement. Trains will be travelling at 180 â€“ 220 km/h (110-135mph). Political planning started 35 years ago. Construction lasted approx. 15 years. Tunneling went thru some hazardous geological formations and one large mechanical drilling train was delayed for 1 Â½ years inside the mountain. Because of the length of the tunnel, construction was started at both ends and thru two shafts sunk at the 1/3 and 2/3 of is length allowing a total of 6 tunneling sites. The overburden of the Alps being 1500 - 2500 m, the miners were working in 35-45Â°C temperatures. Even small incidents in long tunnels can have catastrophic consequences. For this reason, very thorough safety engineering has become the norm: the tunnel consists of 2 separate tubes (one southbound, the other northbound), both being connected by some 150 smaller flight and rescue galleries spaced every 400 m. Detailed monitoring of the dozen trains speeding inside each tube is mandatory because one train losing speed can easily cause a deadly pile-up. The shock of displaced air caused by fast trains inside narrow tubes and the ventilation of a pair of 58 km long tunnels is another challenge. The management and financing of such an infrastructure of European dimensions, is another difficult task for a small country like ours. Interestingly, the project called NEAT (= neue Eisenbahn-Alpen-Transversale) was decided by a plebiscite of the Swiss people in 1994."